Ewing sarcoma/primitive neuroectodermal tumor (PNET): This tumor is treated by Ewing family of tumors (EFT) 2001 chemotherapy protocol. These tumors are also radiosensitive. Undifferentiated “round” cell (“Ewing-like”) sarcoma: These tumors are treated similarly as EFTs. These include a heterogeneous group of genetically defined sarcomas, such as BCOR-CCNB3 and CIC-DUX4-positive sarcomas, characterized by relatively aggressive clinical outcomes, especially the latter subtype. Mesenchymal chondrosarcomas: These are treated similarly as EFTs; however, they are characterized by relatively aggressive clinical outcomes. Neuroblastoma: Treated by children's oncology group (COG) protocol. Non-hodgkin's lymphomas (NHLs): High-grade, large B-cell (CD20-positive) lymphomas are treated by CHOP-Rituximab (R) (anti-CD20), anaplastic large cell lymphomas (ALCLs) are treated by MCP842 protocol. Radiotherapy is also considered while treating these tumors. Small cell osteosarcoma. Treated similarly as a conventional osteosarcoma, by OGS 2012 chemotherapy protocol, at Tata Memorial Hospital, Mumbai. An ideal approach towards diagnosis and management of these tumors is practising a multidisciplinary approach, which includes integration of clinical, radiologic, and histopathologic findings. Most of these lesions, including tumors occur in pediatric patients. During the initial diagnostic “work-up” of any intraosseous lesion, a reasonably well-exposed radiologic image, especially a plain X-ray/radiograph is usefulwhile differentiating a Ewing sarcoma from a small cell osteosarcoma. Lytic lesions are noted in LCH, whereas sclerotic, destructive lesions with periosteal reactions are seen in Ewing sarcomas and osteosarcomas, with different types of periosteal reactions, in both these lesions. Computed tomogram (CT) scan and magnetic resonance imaging (MRI) are useful in staging these tumors. Other modalities, such as a metaiodobenzylguanidine (MIBG) scan and other functional imaging are valuable in the diagnosis of a neuroblastoma. Certain laboratory investigations are equally crucial, such as alkaline phosphatase levels in osteosarcomas, urinary vanillyl mandelic acid (VMA) levels in neuroblastomas, lactate dehydrogenase levels in NHLs, and beta 2 microglobulin levels with serum electrophoresis in cases of plasma cell dyscrasia. In the present times, where “needle is preceding the scalpel,” efforts should be made for exact categorization of malignant RCTs, either on smears, cell blocks, or histopathology, with immunocyto- or immunohistochemistry (IHC). Small blue round cells: Tumor cells with round cells and scant cytoplasm. For example, Ewing sarcoma, neuroblastoma, etc. Relatively large, blue to “pink” round cells: Tumor cells with round nuclei and abundant eosinophilic to amphophilic cytoplasm. For example, plasmacytoma/plasma cell dyscrasia, anaplastic large cell lymphoma (ALCL), rhabdomyosarcoma (mostly in soft tissues), etc. Furthermore, certain morphological features or “clues” such as rosettes in Ewing sarcoma, “salt and pepper-like” chromatin and neuropil in neuroblastomas, plasmacytoid appearance of tumor cells with “cartwheel-like chromatin” in a plasma cell dyscrasia etc., are helpful in formulating morphological differential diagnoses at the upfront. An exact subtyping of malignant RCTs requires ancillary techniques such as IHC and molecular techniques (reverse transcriptase polymerase chain reaction and/or fluorescence in situ hybridization). The utility of electron microscopy has reduced over the years, in view of cost and logistic reasons. Ewing sarcoma: MIC2/CD99 (invariably diffuse, cytoplasmic membranous immunoexpression), NKX2.2, Fli1, Caveolin, coupled with negative expression of LCA. Neuroblastoma: Synaptophysin, chromogranin, neuron-specific enolase (NSE), and CD56. Non-Hodgkin's lymphomas: LCA, CD20, and other lineage specific markers, such as CD30 for ALCL (ALK+ or ALK-), Tdt for lymphoblastic lymphoma, etc. Small cell osteosarcoma: SATB2. Considering a small cell ostosarcoma can be positive for MIC2, similar to Ewing sarcoma, further molecular testing is recommended as Ewing sarcoma is characterized by a specific underlying translocations t (11; 22) (EWS-FLI1), in most cases. Mesenchymal chondrosarcoma: MIC2/CD99 and Leu7. S100 protein highlights the chondroid component. As per the World Health Organization (WHO) classification of tumors of soft tissue and bone, Ewing sarcoma or Ewing sarcoma family of tumors (ESFTs) are a group of small round cell sarcomas showing varying degree of neuroectodermal differentiation, detected by light microscopy, IHC, and/or by electron microscopy. Microscopically, these tumors display uniform, small round cells with round nuclei, scant cytoplasm, and fine nuclear chromatin. By IHC, most of these tumors display diffuse cytoplasmic membranous immunostaining for CD99/MIC2 and intranuclear staining for Fli1., Both these markers are sensitive, however not specific for diagnosis of a Ewing sarcoma. Lately, NKX2.2 has been idenified as a useful IHC marker for diagnosing Ewing sarcomas. Howver, it has limited specificity. Ewing Sarcoma is genetically characterized by recurrent translocations between EWSR1 (Ewing sarcoma RNA binding protein 1) and ETS family of transcription factors. Most of the tumors harbor t (11; 22) – EWSR1-FLI1 or t (21; 22) – EWSR1-ERG transcripts., Detection of these chimeric trascripts and their interpretation in a clinico-radio-pathologic context constitutes as the diagnostic “gold standard” for a Ewing sarcoma. In the recent WHO classification of tumors of soft tissue and bone, a new category of sarcomas has been introduced, namely undifferentiated/unclassified round cell sarcomas, characterized by cells with relatively monotonous round to ovoid cytomorphology with high nuclear to cytoplasmic (N: C) ratios, but no distinct line of differentiation. These tumors lack consistent genetic abnormalities, seen in cases of Ewing sarcoma. Clinically, these tumors are usually found in younger patients, at any location, more frequently in somatic soft tissue sites and are characterized by a relatively more frequent rapid growth and a variable response to presently available conventional chemotherapy regimens [Figure 1], [Figure 2], [Figure 3], [Figure 4]. CIC-DUX4-positive tumors mainly affect young adults in the third or fourth decades of life and affect soft tissues more frequently than bones. These tumors represent a clinically aggressive subset of undifferentiated round cell sarcomas.,, BCOR-CCNB3- positive sarcomas, occurring in extremities, are associated with a relatively favorable clinical course. Mesenchymal chondrosarcoma is one of the rarest bone sarcomas, histologically characterized by a bimorphic growth pattern consisting of islands of more or less differentiated cartilage, admixed with a small cell malignancy frequently associated with a hemangiopericytomatous pattern. About 1/3 of cases occur in the soft tissues. Majority of the cases are reported in the jaw bones, followed by spine, ilium, and ribs. Involvement of skull bones is extremely rare. Among the extra skeletal sites, meninges are reported to be a preferred site of involvement. 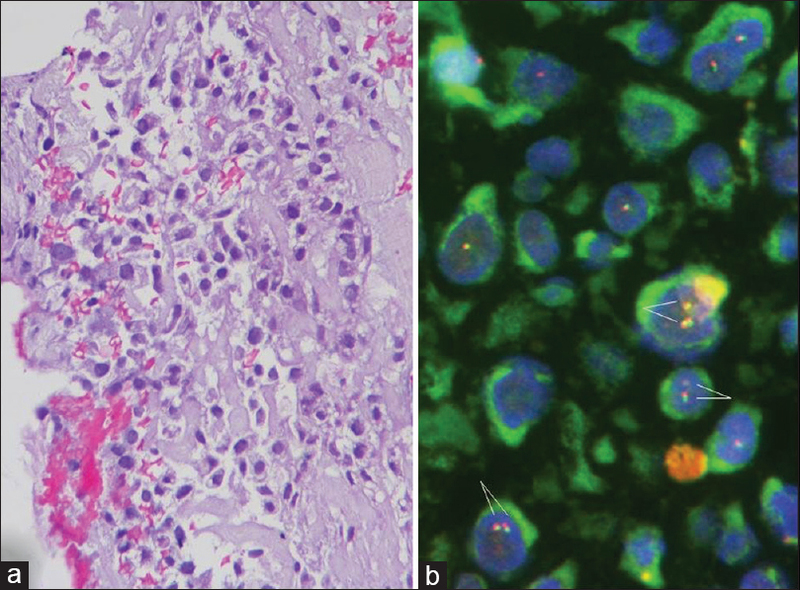 Mesenchymal chondrosarcoma consists of two distinct elements–malignant small round cells and islands of cartilage in varying proportions. The nuclei of small cells are usually round, but may be oval or even spindle shaped. Cytoplasm is scanty and nuclei have usually dense chromatin. One of the characteristic features is thin walled vessels, leading to a hemangiopericytomatous growth pattern. Immunohistochemically, S100 protein is positively expressed in chondroid islands and CD99/MIC2 is expressed in the small cells [Figure 5]., Sox 9 (transcription factor) has been shown to be helpful in differentiating a mesenchymal chondrosarcoma from other small cell malignancies. An identical Robertsonian translocation involving chromosomes 13 and 21 [der (13; 21) (q10; q10)] was reported in mesenchymal chondrosarcoma. Ten years later, a recurrent HEY1-NCOA2 fusion was identified in mesenchymal chondrosarcomas. Some patients present with disseminated metastasis, but others survive for decades. A long term follow-up is mandatory in such cases, since metastasis after 20 years has been reported. Neuroblastoma is a primitive neoplasm of neuroectodermal origin. It is the third most common malignant tumor in the childhood, following lymphoma/leukemia and brain tumors. The peak incidence is 0-4 years (40% in less than 1 year). It is rarely diagnosed prenatally during the 3rd trimester, on ultrasonogram. It occurs anywhere in the sympathoadrenal neuroendocrine system. All patients with metastatic (stage 4) disease diagnosed after 18 months of age are in the high-risk category. 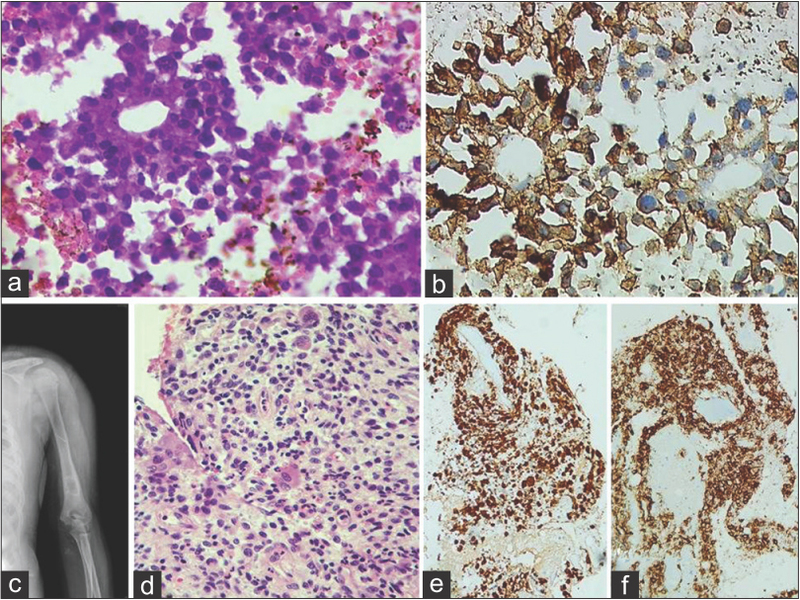 At the time of diagnosis, the defining characteristics of high-risk neuroblastoma include an age of more than 1 year, metastases, amplification of the MYCN oncogene, and histologic findings. 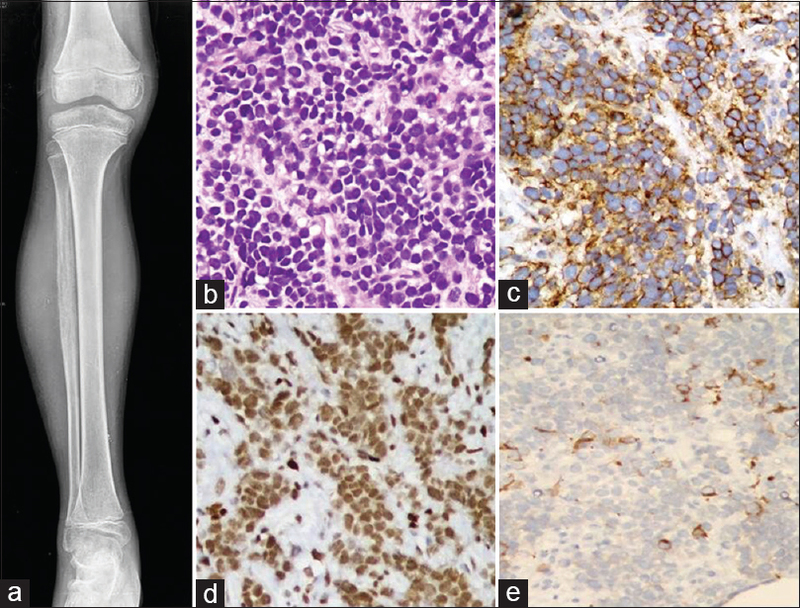 At the same time, chronic osteomyelitis can mimic intraosseous lymphomas [Figure 8]. Certain features, such as increase in C-reactive protein and a characteristic radiologic feature, namely penumbra sign (a higher signal intensity feature of the thin layer of granulation tissue which lines the abscess cavity on T1-weighted MRI images), is used to differentiate the two lesions. Although not a classic RCT, a plasma cell dyscrasia/tumor can constitute a differential diagnosis of a small RCT, in view of certain overlapping morphological features [Figure 9]a and [Figure 9]b. This is an uncommon histiocytic disorder, which accounts for ~0.5-5.4 cases/million persons/year. Although it primarily occurs in the pediatric patients, any age group can be affected. It has a wide spectrum of clinical presentation, ranging from an isolated skin or bone lesion to a life-threatening multisystem disease and the manifestation depends upon the extent of involvement. The bone lesions are often asymptomatic and detected incidentally during radiographic investigation for unrelated disorders. Unifocal bone lesions (eosinophilic granuloma) are usually solitary and characteristically affect the calvaria, vertebra, rib, mandible, femur, ilium, and scapula. Bone pain, soft tissue mass, neurologic manifestations because of extension of calvarial lesions into the nervous system, spontaneous long bone fracture, and vertebral collapse with spinal cord compression can occur. Otitis media in temporal and mastoid bone involvement, loose teeth in mandibular lesion, and pituitary dysfunction in sella turcica involvement may be seen. Multifocal lesions might have a protean history depending on the location and degree of bone and adjacent tissue involvement. Diabetes insipidus, exophthalmos, and bony lesion especially in the cranium occur in Hand-—Schüller-Christian disease. LCH can involve single system with unifocal or multifocal lesions with i) extraosseous, ii) osseous, iii) skin (seborrheic involvement of scalp, purplish papules on body, red papular rash on groin, abdomen, back, chest, etc. ), iv) lymph node, v) hypothalamic/pituitary/central nervous system, or vi) other organs such as thyroid involvement. In a multisystem disease more than or two organs or systems including bone, gastrointestinal tract (liver and spleen), lungs, bone marrow, endocrine and CNS, skin and lymph nodes are affected. Liver and spleen are high-risk organs as any involvement of these organs indicates an unfavorable prognosis. Sclerosing cholangitis is a serious complication. Lungs are more frequently involved in adults. Tachypnea with rib retractions and cystic/nodular pattern are usual clinical signs. Pulmonary involvement is seen in ~25% of children with multisystem disease. Thrombocytopenia and anemia with or without neutropenia are associated with marrow involvement. Patients with hemophagocytosis involving the bone marrow are also at a very high-risk group. It is crucial to diagnose individual small cell lesions, especially tumors of the bone, in view of their different treatment regimens. An exact diagnosis required application of ancillary techniques, such as IHC and molecular diagnosis. Morphology remains the cornerstone in the diagnosis and is a guide towards choosing optimal immunohistochemical markers and molecular tests. The value of radiologic correlation in the diagnosis of various bone tumors cannot be overemphasized. At all times, one needs to be aware of “look-alikes,” such as osteomyelitis, which can mimic a Ewing sarcoma. Newer genetic transcripts have been unraveled driving certain undifferentiated round cell/Ewing-like sarcomas. High throughput techniques, such as next-generation sequencing can be utilized in designing and application of panels for RCTs. Li S, Siegal GP. Small cell tumors of bone. Adv Anat Pathol 2010;17:1-11. Roessner A, Jürgens H. Round cell tumours of bone. Pathol Res Pract 1993;189:111-36. Llombart-Bosch A, Contesso G, Peydro-Olaya A. Histology, immunohistochemistry, and electron microscopy of small round cell tumors of bone. Semin Diagn Pathol 1996;13:153-70. Hameed M. Small round cell tumors of bone. Arch Pathol Lab Med 2007;131:192-204. Seningen J, Inwards CY. Small round cell tumors of bone. Surg Pathol Clin 2012;5:231-56. Bajpai J, Khanna N, Vora T, Gulia A, Laskar S, Puri A, et al. Analysis of bone and soft-tissue sarcomas registered during the year 2012 at Tata Memorial Hospital, Mumbai, with clinical outcomes. Indian J Cancer 2018;55:37-44. Sharp SE, Trout AT, Weiss BD, Gelfand MJ. MIBG in neuroblastoma diagnostic imaging and therapy. Radiographics 2016;36:258-78. Strenger V, Kerbl R, Dornbusch HJ, Ladenstein R, Ambros PF, Ambros IM, et al. Diagnostic and prognostic impact of urinary catecholamines in neuroblastoma patients. Pediatr Blood Cancer 2007;48:504-9. Rekhi B, Gorad BD, Chinoy RF. Scope of FNAC in diagnosis of soft tissue tumors-A study from a tertiary Cancer Referral Center in India. Cytojournal 2007;4:20. Machado I, Navarro S, Picci P, Llombart-Bosch A. 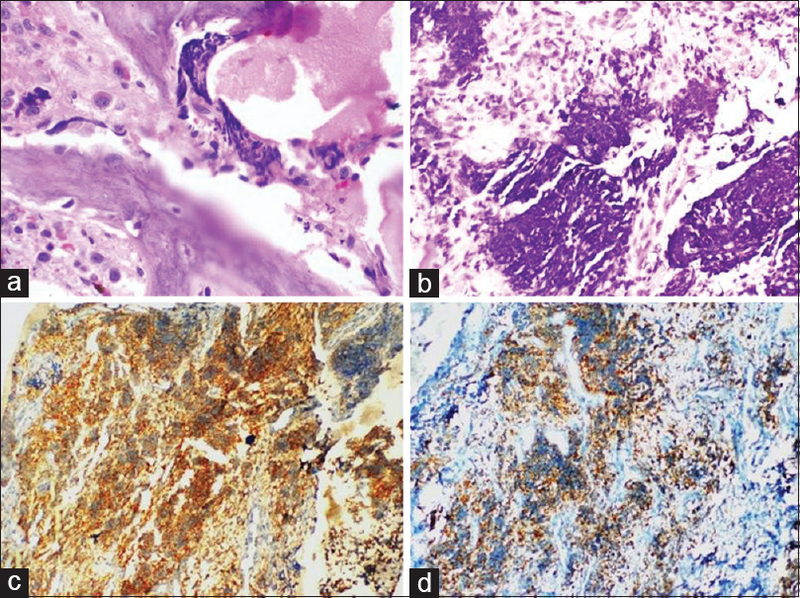 The utility of SATB2 immunohistochemical expression in distinguishing between osteosarcomas and their malignant bone tumor mimickers, such as Ewing sarcomas and chondrosarcomas. Pathol Res Pract 2016;212:811-6. Rekhi B, Vogel U, Basak R, Desai SB, Jambhekar NA. Clinicopathological spectrum of 58 Ewing Sarcomas/PNETs, including molecular results with validation of EWSR1 rearrangement by conventional and array FISH technique in certain cases. Pathol Oncol Res 2014;20:503-16. Hung YP, Fletcher CD, Hornick JL. Evaluation of NKX2-2 expression in round cell sarcomas and other tumors with EWSR1 rearrangement: Imperfect specificity for Ewing sarcoma. Mod Pathol 2016;29:370-80. Puls F, Niblett A, Marland G, Gaston CL, Douis H, Mangham DC, et al. BCOR-CCNB3 (Ewing-like) sarcoma: A clinicopathologic analysis of 10 cases, in comparison with conventional Ewing sarcoma. Am J Surg Pathol 2014;38:1307-18. Gambarotti M, Benini S, Gamberi G, Cocchi S, Palmerini E, Sbaraglia M, et al. 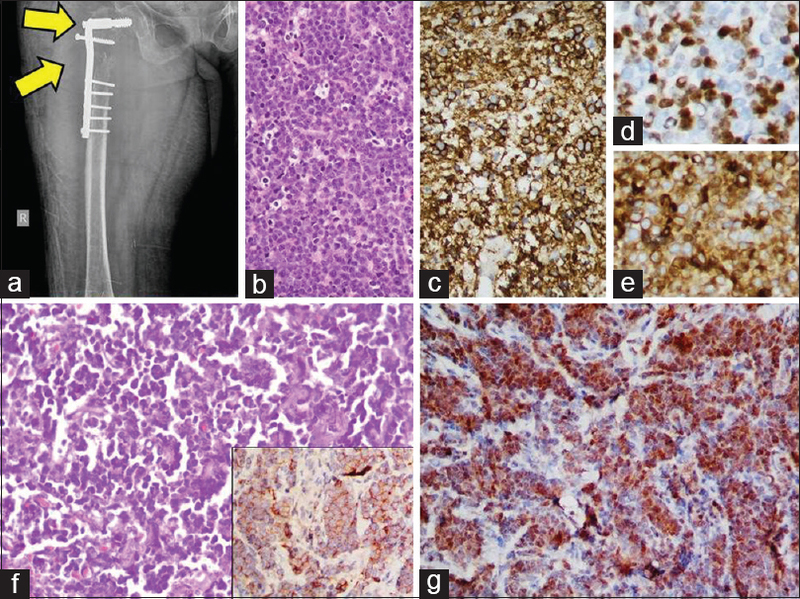 CIC-DUX4 fusion-positive round-cell sarcomas of soft tissue and bone: A single-institution morphological and molecular analysis of seven cases. Histopathology 2016;69:624-34. Rekhi B, Basak R, Desai SB, Jambhekar NA. 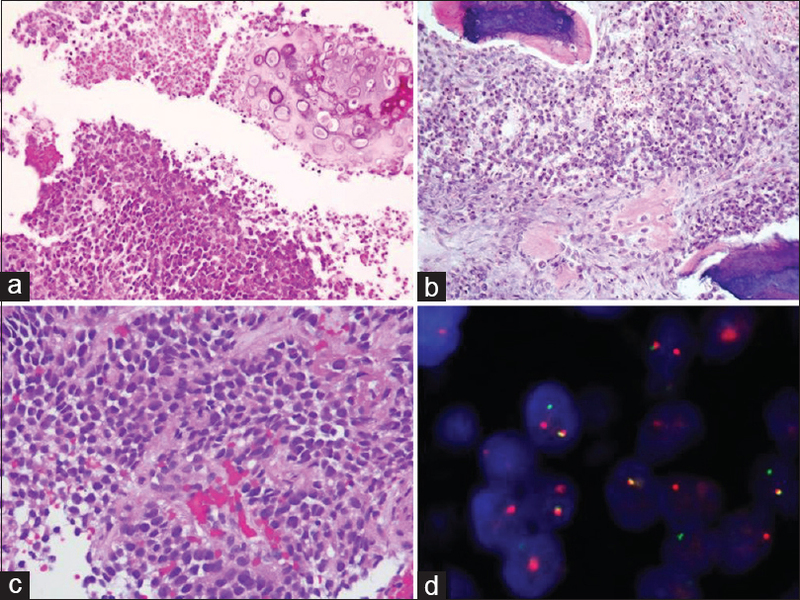 A t (11; 22) (p13; q12) EWS-WT 1 positive desmoplastic small round cell tumor of the maxilla: An unusual case indicating the role of molecular diagnosis in round cell sarcomas. J Postgrad Med 2010;56:201-5. Rekhi B, Ahmed S, Basak R, Qureshi SS, Desai SS, Ramadwar M, et al. 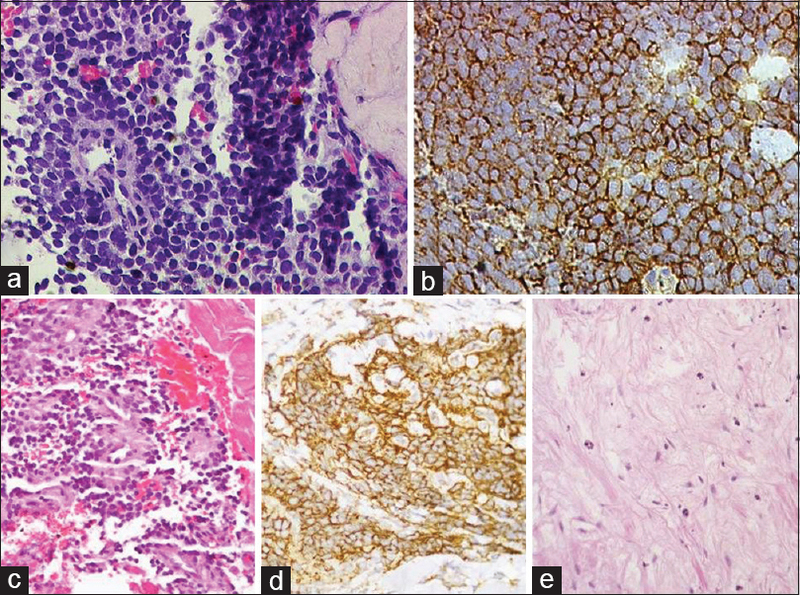 Desmoplastic small round cell tumor- Clinicopathological spectrum, including unusual features, and immunohistochemical analysis of 45 tumors diagnosed at a tertiary cancer referral centre, with molecular results (EWS-WT1) in select cases. Pathol Oncol Res 2012;18:917-27. 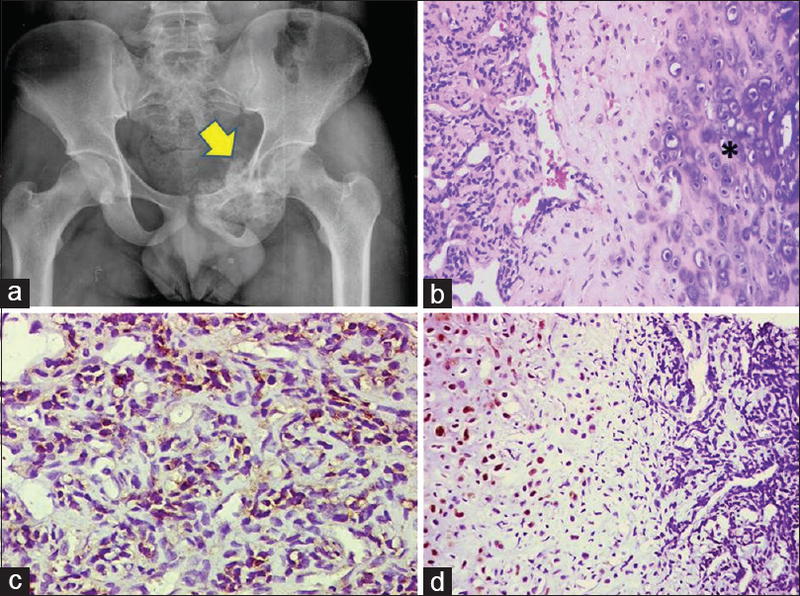 Fletcher CDM, Bridge JA, Lee J. Undifferentiated/Unclassified sarcomas. In: Fletcher CDM, Bridge JA, Hogendoorn PCW, Mertens F, editors. WHO Classification of Tumours of Soft Tissue and Bone, 4th ed. Lyon: IARC; 2013. p. 236-8. Delattre O, Zucman J, Melot T, Garau XS, Zucker JM, Lenoir GM, et al. The Ewing family of tumors-a subgroup of small-round-cell tumors defined by specific chimeric transcripts. N Engl J Med 1994;331:294-9. Specht K, Sung YS, Zhang L, Richter GH, Fletcher CD, Antonescu CR. Distinct transcriptional signature and immunoprofile of CIC-DUX4 fusion-positive round cell tumors compared to EWSR1-rearranged Ewing sarcomas: Further evidence toward distinct pathologic entities. Genes Chromosomes Cancer 2014;53:622-33. Pierron G, Tirode F, Lucchesi C, Reynaud S, Ballet S, Cohen-Gogo S, et al. Anew subtype of bone sarcoma defined by BCOR-CCNB3 gene fusion. Nat Genet 2012;44:461-6. Italiano A, Sung YS, Zhang L, Singer S, Maki RG, Coindre JM, et al. High prevalence of CIC fusion with double-homeobox (DUX4) transcription factors in EWSR1-negative undifferentiated small blue round cell sarcomas. Genes Chromosomes Cancer 2012;51:207-18. Zoubek A, Pfleiderer C, Salzer-Kuntschik M, Amann G, Windhager R, Fink FM, et al. Variability of EWS chimaeric transcripts in Ewing tumours: A comparison of clinical and molecular data. Br J Cancer 1994;70:908-13. Casali PG, Bielack S, Abecassis N, Aro HT, Bauer S, Biagini R, et al. Bone sarcomas: ESMO-PaedCan-EURACAN Clinical Practice Guidelines for diagnosis, treatment and follow-up. Ann Oncol 2018;29(Suppl 4):iv79-95. Nakashima Y, Unni KK, Shives TC, Swee RG, Dahlin DC. 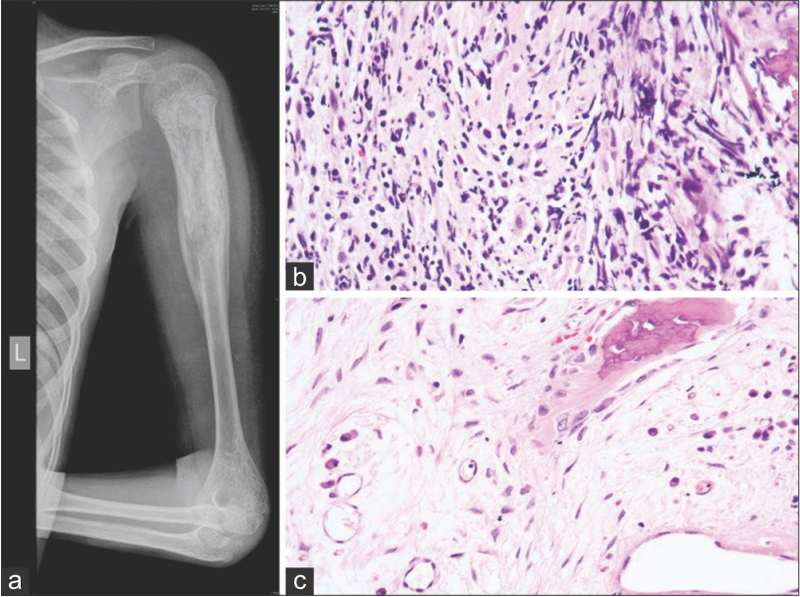 Mesenchymal Chondrosarcoma of bone and soft tissue: A review of 111 cases. Cancer 1986;57:2444-53. Nakashima Y, de Pinieux G, Ladanyi M. Undifferentiated/Unclassified sarcomas. In: Fletcher CDM, Bridge JA, Hogendoorn PCW, Mertens F, editors. WHO Classification of Tumours of Soft Tissue and Bone, 4th ed. Lyon: IARC; 2013. p. 271-2. Wehrli BM, Huang W, De Crombrugghe B, Ayala AG, Czerniak B. Sox9, a master regulator of chondrogenesis, distinguishes mesenchymal chondrosarcoma from other small blue round cell tumors. Hum Pathol 2003;34:263-9. Naumann S, Krallman PA, Unni KK, Fidler ME, Neff JR, Bridge JA. Translocation der (13; 21) (q10; q10) in skeletal and extraskeletal mesenchymal Chondrosarcoma. Mod Pathol 2002;15:572-6. Wang L, Motoi T, Khanin R, Olshen A, Mertens F, Bridge J, et al. Identification of a novel, recurrent HEY1-NCOA2 fusion in mesenchymal chondrosarcoma based on a genome-wide screen of exon-level expression data. Genes Chromosomes Cancer 2012;51:127-39. Shohet J, Foster J. A review and update on neuroblastoma BMJ 2017;357:j1863. Bielle F, Fréneaux P, Jeanne-Pasquier C, Maran-Gonzalez A, Rousseau A, Lamant L, et al. PHOX2B immunolabeling: A novel tool for the diagnosis of undifferentiated neuroblastomas among childhood small round blue-cell tumors. Am J Surg Pathol 2012;36:1141-9. Cheung NK, Dyer MA. Neuroblastoma: Developmental biology, cancer genomics and immunotherapy. Nat Rev Cancer 2013;13:397-411. Maris JM. Recent advances in neuroblastoma. N Engl J Med 2010;362:2202-11. Krishnan A, Shirkhoda A, Tehranzadeh J, Armin AR, Irwin R, Les K. Primary bone lymphoma: Radiographic-MR imaging correlation. Radiographics 2003;23:1371-83; discussion 1384-7. Heyning FH, Hogendoorn PC, Kramer MH, Hermans J, Kluin-Nelemans JC, Noordijk EM, et al. Primary non-Hodgkin's lymphoma of bone: A clinicopathological investigation of 60 cases. Leukemia 1999;13:2094-8. Shimose S, Sugita T, Kubo T, Matsuo T, Nobuto H, Ochi M. Differential diagnosis between osteomyelitis and bone tumors. Acta Radiol 2008;49:928-33. Emile JF, Abla O, Fraitag S, Horne A, Haroche J, Donadieu J, et al. Revised classification of histiocytoses and neoplasms of the macrophage-dendritic cell lineages. Blood 2016;127:2672-81. Stull MA, Kransdorf MJ, Devaney KO. Langerhnas cell histiocytosis of bone. Radiographics 1992;12: 801-23. Alayed K, Medeiros LJ, Patel KP, Zuo Z, Li S, Verma S, et al. BRAF and MAP2K1 mutations in Langerhans cell histiocytosis: A study of 50 cases. Hum Pathol 2016;52:61-7.